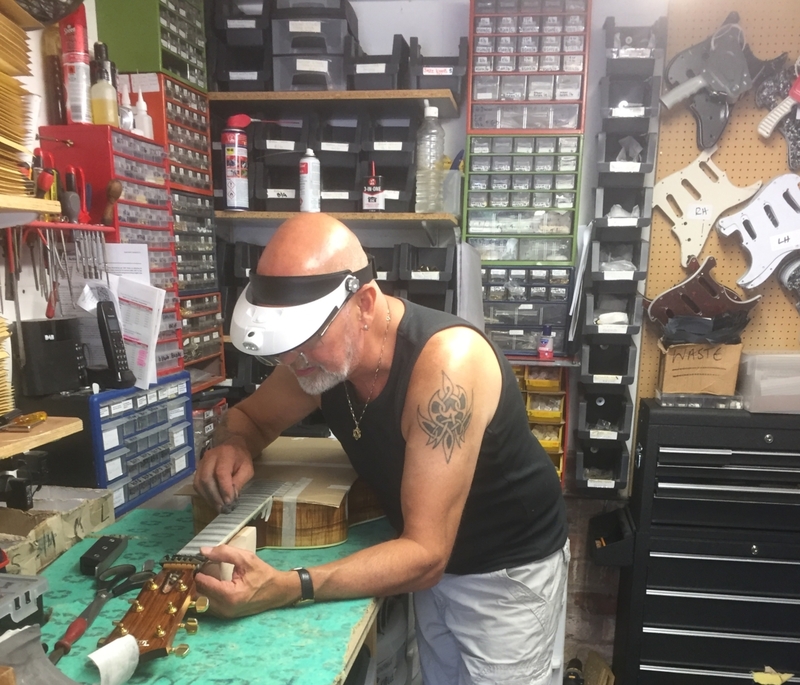 For over 40 years Andy De Looze has specialised in offering precise repairs and setups to the guitar community. Andy takes pride in doing fine and detailed work. From a basic set-up to a complete re-fret and most things in between! He is skilled in this area & it’s often been said that ‘he has the patience of a saint’ when it comes to the macro setups he does. At RGG, we also carry stocks of the majority of replacement parts for the job, so it saves you valuable time & frustration in hunting down that elusive part! Please check out the prices below, but if there is any other area of repair that you require, please just contact Andy through the contact link on our home page. Assessments & quotations for any instrument are free of charge. If a repair is not listed, please enquire. Prices apply to both acoustic and electric guitars. intonation set using a chromatic tuner. “Just like to thank Andy De Looze @ Really Great Guitars for doing a great professional job sorting out my Taylor Acoustic out! A complete fret dress and set up. Guitar plays as good as when I first bought it! Also thanks for the set up of my CS Telecaster he gave the bridge the correct radius sorting out the intonation and choking up the top end of the neck when bending above a full-tone bend! “Andy, thank you so much for the work you completed on my guitar at the weekend! What a difference!